We board our floating hotel from 6.00pm. We have a welcome cocktail in the lounge bar and are introduced to the crew. Dinner on board. The rest of the evening is free.Overnight stop. CLASSIC: Visit of the Doge’s palace(4) and the seat of the Palace of Justice. 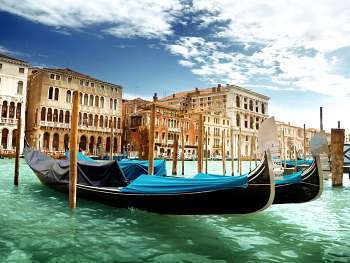 DISCOVERY as a supplement: Following the footsteps of Casanova in Venice. 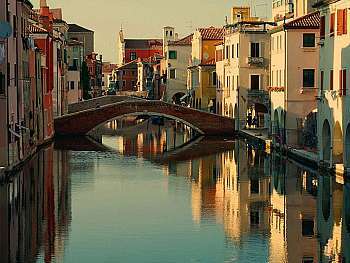 The afternoon, excursion common for both packages : visit the islands in the Lagoon, Murano and Burano, famous for its lacework which was developed on the island in the 16th century. Return on board and cruise to Venice. Overnight stop. Cruise to Chioggia, where we arrive late morning. CLASSIC: Visit of Padua, the main setting for Shakespeare’s The Taming of the Shrew. DISCOVERY as a supplement: Hiking on the wine route, through the Euganean Hills and the village of Arquà Petrarca. Meanwhile your floating hotel cruises to Taglio di Po. Back on board for dinner in Taglio di Po(3). If you do not choose to go to the Padua excursion, a transfer is established to the town of Adria to allow you to discover this citys charm to the fullest, from where The Adriatic Sea.is named after. Then drive to Taglio Di Po where we join our boat. Evening of entertainment. Overnight stop. Cruise to Polesella, where we arrive late morning. The afternoon, excursion common for both packages to discover Bologna, an authentic medieval city perfectly preserved. Return on board at Polesella. Free evening on board. Overnight stop. DISCOVERY as a supplement: Verona by bike and the Giusti Gardens, one of the city’s marvels. During this time the ship sails towards Chioggia(3). Those who have not booked the tour continue cruising on the Po. A coach transfer is planned from Porto Levante to reach Chioggia. This port city of Roman origin, is the second largest city of the Republic serene and contains works and testimonials from various periods and various styles. Free time in Chioggia before returning to our boat. Overnight stop. Cruise to Venice and arrival early morning. CLASSIC : Visit of the Castello quarter(2) in search of the secret Venice through its old quarters to the Church of Santi Giovanni e Paolo. DISCOVERY as a supplement: You’ll leave on foot from The Zattere or San Basilio Pier. The afternoon is free to explore Venice independently on foot or perhaps take an optional gondola trip (booking and settlement on board). Gala evening. Overnight stop. After breakfast on board this morning, we disembark around 9.00am(5). End of our journey.